Delhi's Bus Rapid Transit System (BRT) has been running for just over two years now, connecting the 14.5 km corridor between Ambedkar Nagar and Delhi Gate. 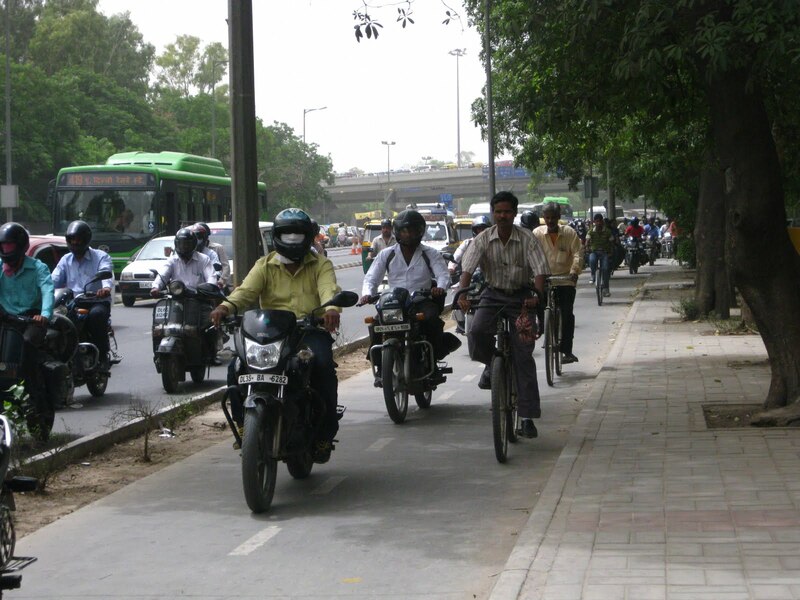 To see how the controversial project is faring, I spent some time on the BRT during the past few weeks, traveling by bus, foot, auto and cycle, mostly between Chirag Dilli and Moolchand. 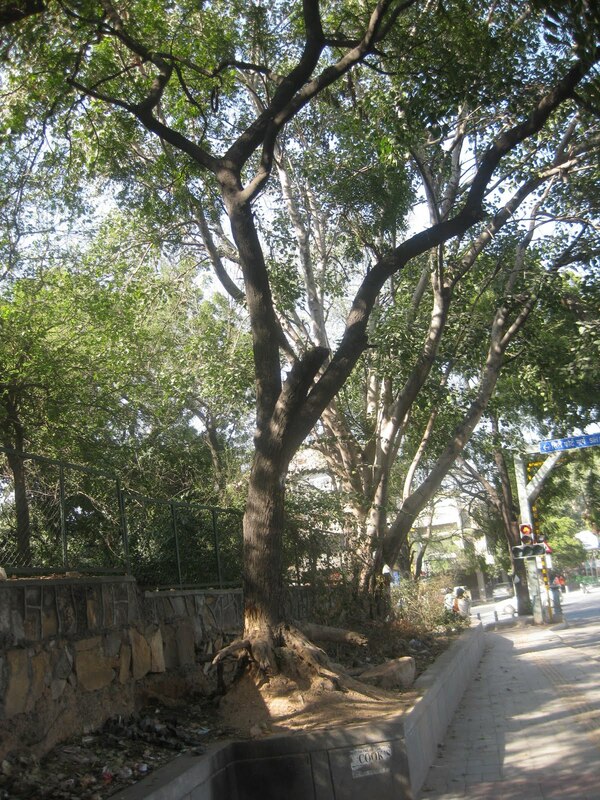 In other places, trees were saved without impacting traffic. And elsewhere, carelessness resulted in trees being damaged needlessly. 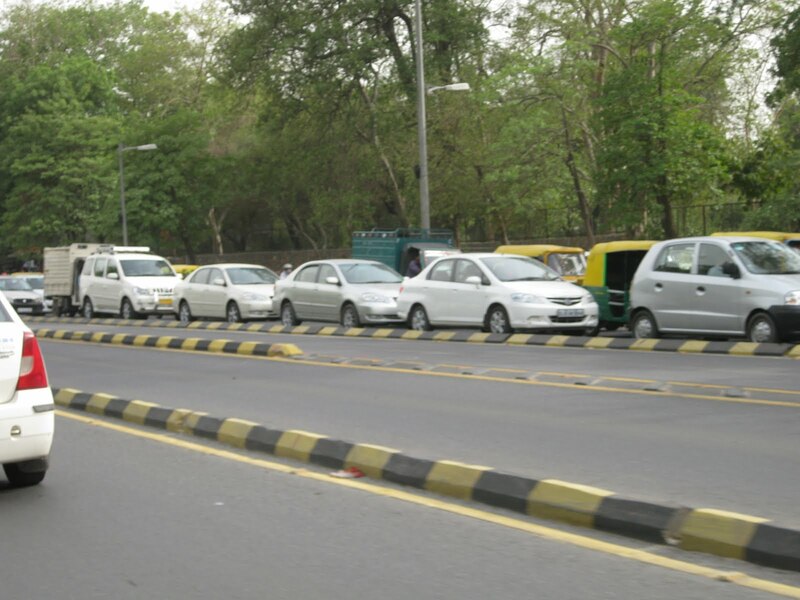 Even mid-day traffic can be difficult on the BRT--for private vehicles. But the bus lane that you see there in the foreground, is empty, which makes bus travel much faster on the BRT than anywhere else in the city. Interestingly enough, the BRT actually seems to have more support than you'd think from people who don't ride buses. But bus riders are its biggest backers--and why not? The BRT moves buses quickly. And since about 60% of Delhi commuters travel by bus, it's not hard to see why the BRT is still going strong. On the BRT, you have several options in buses. 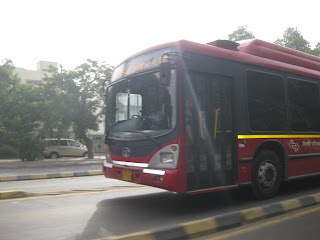 The red AC bus, pictured here, starts at Rs. 15 per ticket, and offers the chance of some room to breathe, even during rush hour. A large part of what makes commutes by bus difficult is the time spent waiting; changing buses takes even more time. 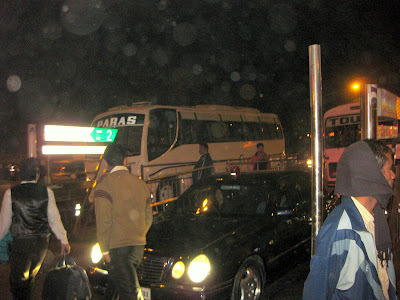 Buses also have to make many stops, of course, and then they have to rejoin traffic. 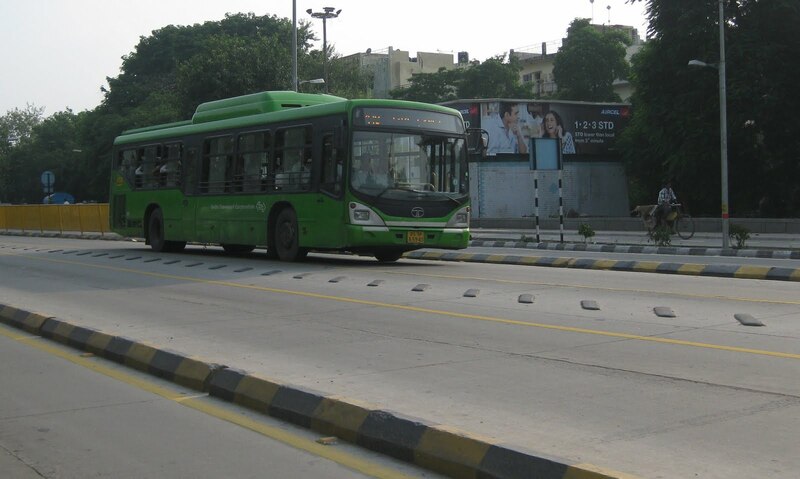 But the BRT partly compensates for all that, by giving buses those two center lanes. 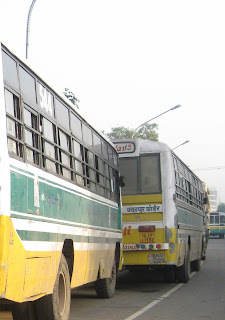 I found that no matter when I traveled, direct trips on the BRT took about the same time--and sometimes even a little less--than a comparable trip by autorickshaw. Waiting for the bus is rarely fun, but the BRT bus stops are a step up from what you get in most of Delhi. 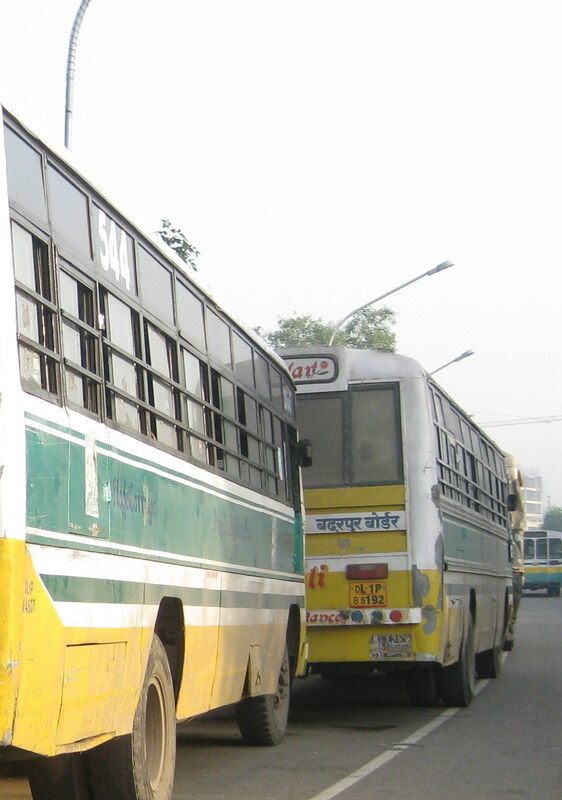 For one thing, buses tend to stop at BRT stops, which means you have less of a need to run out into traffic and jump onto rolling Bluelines! For a while, it looked like the police would refuse to enforce the BRT bus lanes, but that seems to have changed. 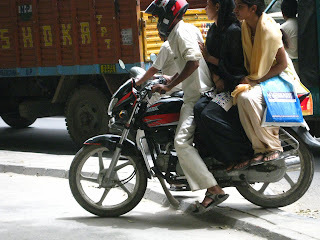 You will find an occasional motorcyclist pushing his luck, or even a car, but this is rare. VIP vehicles bearing red lights, on the other hand, do not seem to worry about police--or the example they are setting, for that matter. They frequently travel by bus lane, even when there is no reason to do so. It looked like there was a party going on in this VIP car a few months back. Of course the BRT is not just for buses and private vehicles; it's also for cycles. 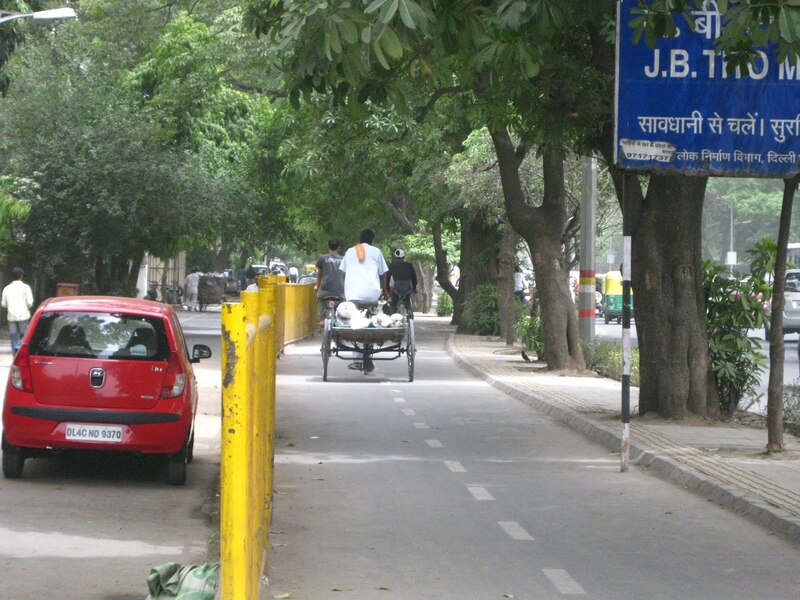 Along the corridor, there are places where you can rent a cycle. It costs only Rs. 10 for four hours. The cycle rental stands are a private-public partnership, and they are a very good idea. I'll write about this more later. But for now let me say that business is slow, in part because you cannot take a cycle from one stand and return it to another. As a result, these cycles can be used for recreation and for visiting friends in the neighborhood, but they won't help you get to work. 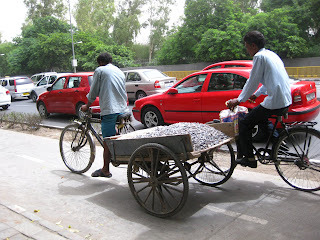 That is too bad, because I found it quite easy to cover the distance from Chirag Dilli to Moolchand by cycle in about 10 minutes, which is faster than bus or autorickshaw, if you include the wait time. The same was true for the return trip. 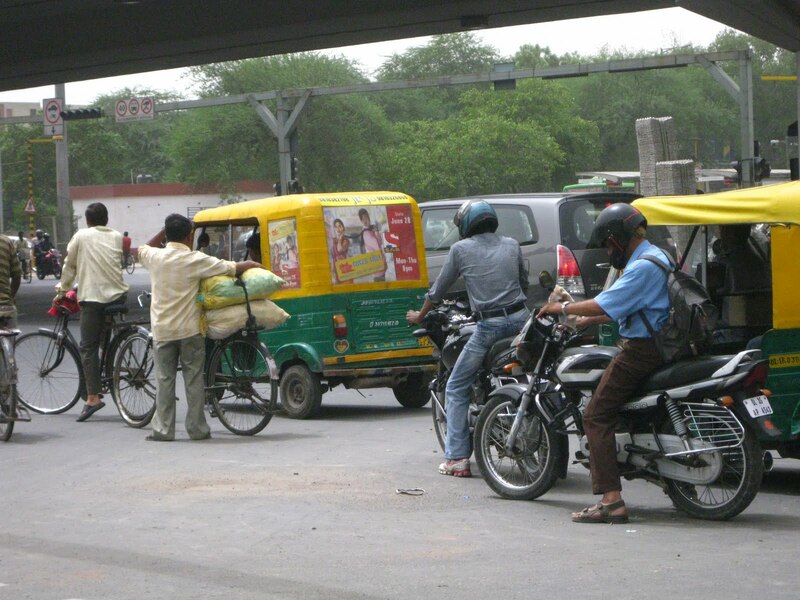 Rent-a-cycles could be a valuable part of the BRT system if only this project were taken a bit more seriously. But when traffic is really bad, many motor bikes find the cycle lanes a little too tempting. Then a few more join the crowd, which begins to make it difficult on the cyclists. 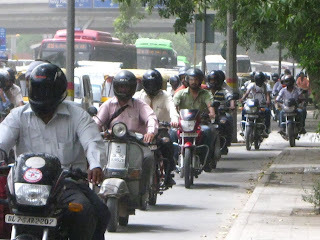 Motorcyclists have a tough time of it in Delhi roads, of course. But they don't belong in the cycle lane. 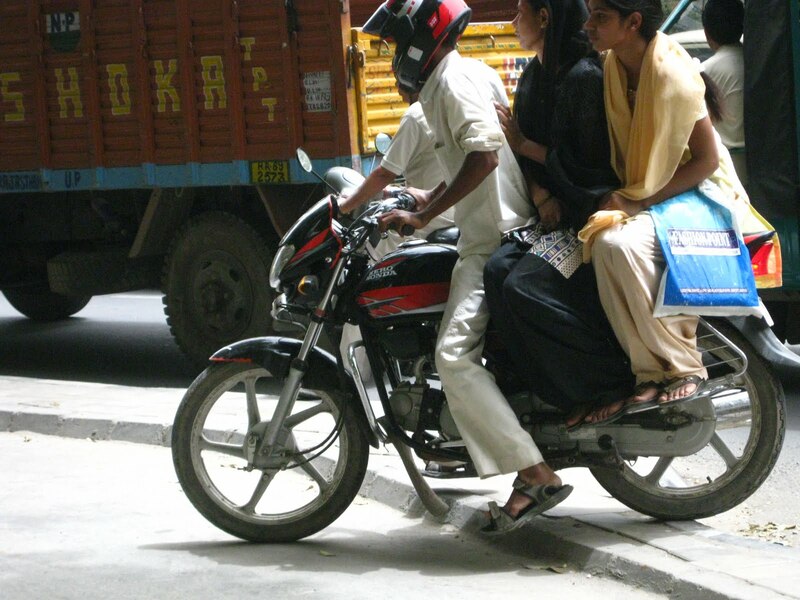 I can tell you from personal experience that having a pack of two wheelers overtaking your cycle on a narrow lane is...unnerving, to say the least. The police need to take this more seriously, but having conceded as much ground as they already have to the motor bikes, one wonders how easy it would be to re-take the cycle lane for cyclists. It's a big problem, and I don't see it getting fixed soon. Still, you have to admit the cycle lane is probably better than the alternative. That may not look so bad now, but wait until the light changes and those vehicles start moving. Not a lot of fun, I can tell you that! Delhi roads are difficult for cyclists, where ever you go. And cycles are probably the most sustainable form of transportation, other than walking! Better still, why not take a cycle or bus ride and see what you think! If you like what you've seen here, check out our photo essay page! @Bhagwad--In an ideal world, the BRT would make everyone happy. But this project reminds us that if your road size is limited, you cannot always please all forms of commuters as long as the volume of traffic keeps growing. 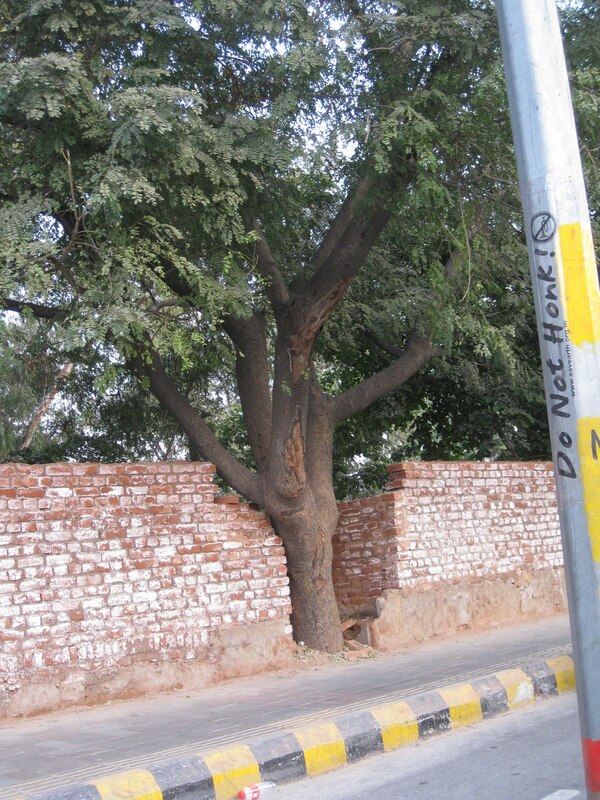 Unless thousands more trees are cut--which is politically hard to do, not so much because Delhi is so "green" but because we depend on the shade trees give, the road can't get much wider. Of course you could help traffic flow by creating a huge "double layer" flyover at the worst intersection, but that would be massively expensive, and would require diversion of funds from other programs. What's unusual about the BRT, is that bus commuters do better than those who travel in private vehicles. In retrospect, it probably would have made sense to launch the concept in a place where win-win was easier to accomplish. @cybershamen: Yes, sharing and caring is the best for all of us. Unfortunately, that is not as obvious as it should be to many. In this article, I will discuss some things you can do as a parent to help your child succeed in writing an essay. Because big essays are being written well within each child. There are numerous journalists who don't try checking CENTRAL KENYA on their articles for spelling mistakes in this way a few words may not be suited for the story. Excellent Blog! I would like to thank for the efforts you have made in writing this post 71200X exam study guide. I am hoping roofing company roselle the same best work from you in the future as well. I wanted to thank you for this websites!